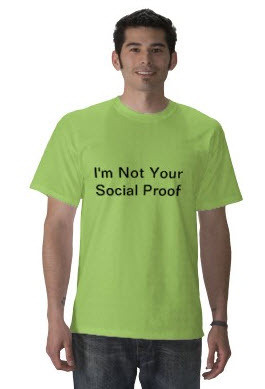 Social proof is dying as a startup differentiation heuristic during fundraising. Why? Every company I see has some roster of advisors and/or soft-circled seed investors already committed. It’s gone from evidence of company traction to merely an execution step before hitting ‘publish’ on the Angellist profile. As a result, most savvy investors are starting to discount (or at least push on) the value of an advisory board unless the founder can articulate why that’s important. For example, a friend of mine is building an app with a very specific target market. Within this market there’s a name or two that would really help him build credibility with customers, and thus he’s pursuing a strategic advisory relationship. So many investors. Angel investors, incubators, early stage funds, later stage funds with seed side funds. And they’re all spreading little bets everywhere so any one of them deciding to back your company is less differentiated than prior. C) Maybe Social Proof Doesn’t Work? My personal experience is that the angel investments where I relied more on social proof than my own direct relationship with the team, have been less productive (both in terms of return and fun). So while investing syndicates are cultivated over time, the happenstance moment-in-time collection of a handful of investors seems to not add much value, especially when there’s a first time entrepreneur. I’d go so far as to say a party round for me is now a negative signal in many deals because the lack of a lead investor suggests there might not be a single individual who really has a personal stake in the outcome. A Quora question on whether social proof works as an investing strategy has an interesting answer from Naval who notes that if all investors rely upon social proof it changes the nature of the marketplace. So if you’re a founder, don’t worry as much about signaling. Figure out who you want to work with, have a great rationale for involving them and then build a relationship. For angel investors, if you don’t have time to actually understand a company and are just following social proof, you’re better off becoming a LP in an early stage fund and letting them do it for you. For advisors, please focus on adding value. If you’re not delivering 2x more than your equity is worth, consider stepping aside. ← Do tech turnarounds even exist?